Grand Central Terminal. Sandy Campbell slideshow (February 20, 2010). Click to play. 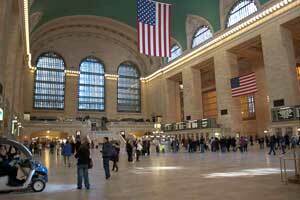 On Saturday, February 20, the Division ran the 28th annual Grand Central Terminal tour. Unfortunately, those in attendance suffered a start delay problem, due to miscommunication with our friends at Metro North. We apologize for any inconvenience caused by the delay, and hope everyone who took the tour enjoyed it. The NY Division of the ERA is pleased to announce its 28th annual guided tour of Grand Central Terminal on Saturday, February 20, 2010. This magnificent Terminal, officially dedicated on February 2, 1913, is now better than ever after comprehensive restoration work. Please join us for a pleasant day of exploring one of New York’s architectural masterpieces. The tour will meet in the stationmaster’s Office at 9:45 AM The stationmaster’s Office is located under the West Balcony on the main level. Download the trip flyer below to order tickets. For further updates and information, call 201-684-9408. Tour operates rain or shine.